I have been eating out in the Orlando area since 1984. It’s now 2012. I have seen a lot of restaurants come and go. We have only had a few gems left in this town that have been around for a long time that serves great food, and has impeccable service. One of the few gems left I am referring too is Chatham’s Place. In my opinion this is an old school Orlando high-end restaurant that gets it right on all levels. Chatam’s reminds me of one of my old favorites that closed many years ago Lee’s Lakeside. It falls in that type of bucket regarding food, service, atmosphere, and price range. If you are trying to impress business clients or if your family member is having a birthday or if it’s your wedding anniversary or another special occasion, or you are just looking to be wined and dined, Chatam’s Place will not disappoint your expectations. I started with the House Special Salad $10.50. The salad consisted of baby greens, tomatoes, cucumbers, red onions, croutons, radish, crumbled gorgonzola, with balsamic vinaigrette. And right before the salad was served they brought us a fresh warm loaf of bread stuffed with a feta cheese spread. The bread was warm and delicious married with fresh cheese, and the salad was like salad you would make at home when you are cooking your favorite meal. On two different unexpected occasions during the dining experience the server brought small dishes of appetizers and the server politely said “this is compliments of the chef” just another nice touch that was added to the evening. One of their signature dishes I tried is the Florida Black Grouper $33.00. The Black Grouper is served with a pecan butter sauce and scallions. This fish did not disappoint. The fresh filet of fish was not too thick; it was sautéed in pecan butter sauce with scallions with some cayenne pepper that gave it a nice kick and flavor which also lowered the sweetness from the pecans. 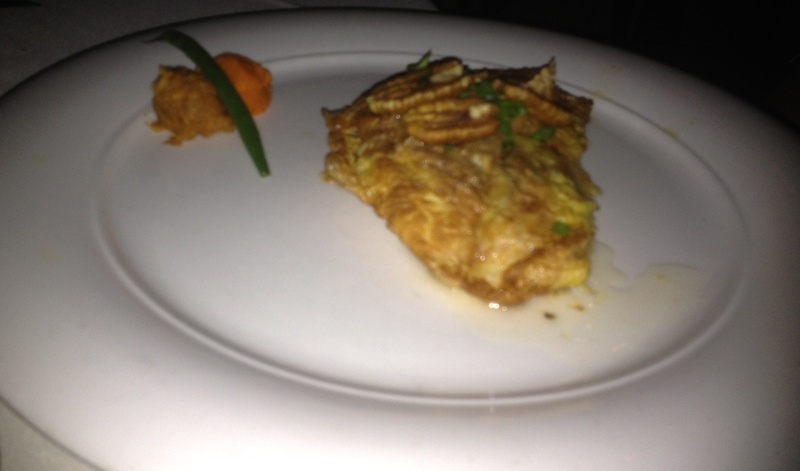 The Florida Grouper was outstanding; it was so well-balanced in flavors. 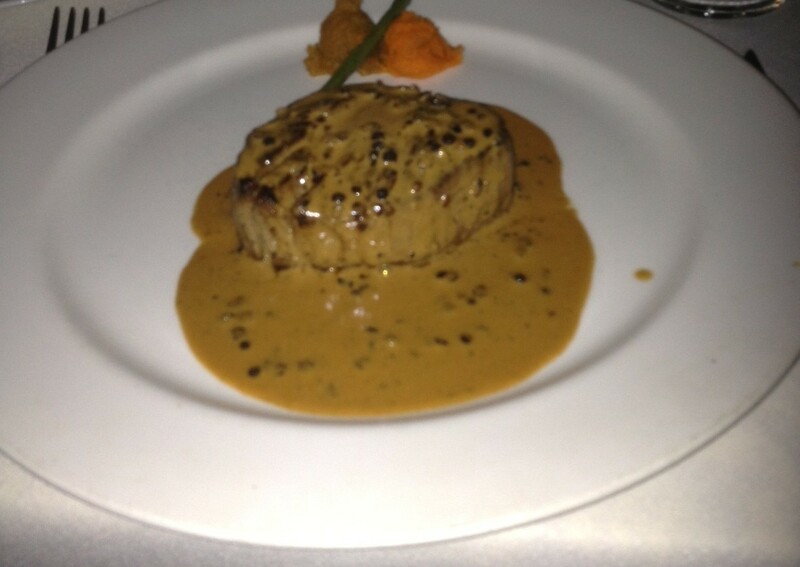 I also tried the 6oz Filet Mignon $34.00. The steak was a Center Cut Angus Beef Tenderloin which was cooked in a Madeira Demi-Glaze. I also elected to add the Peppercorn Cognac Sauce$3.50. The steak was prepared to exactly medium as requested. The well seasoned steak was quite tender and the peppercorn sauce was well-flavored. It is tough to find a better filet than that. Chatham’s Place also serves about 6 different sides to choose from. They range from $4.50-$8.50. I tried the Cauliflower Gratin $8.50 and the Steamed Broccoli $8.00. Both side items were good but l liked the Cauliflower over the Steamed Broccoli. Chatam’s is a memorable fine dining experience; Chatham’s Place is a rare restaurant in the Orlando area that delivers superb quality in every menu offering: spectacular food and wine, outstanding service and a subdued, elegant ambiance at a reasonable expense. They also have a piano player on the premise that does an excellent job playing the right music awhile you dine. After twenty-four years of fine dining experience, this small restaurant provides a warm, quiet dining room with elegant touches in dark wood decor. The refined, well-trained serving team is professionally dressed in blue blazers and ties demonstrating that no detail is overlooked. All the staff members were seasoned professionals. They each have a detailed knowledge of the preparation of each dish on the menu, which includes entrees of fresh fish, crab, chicken, lamb, duck, and of course aged beef. The culinary skills of the kitchen staff are more than sufficient. Each phase of the meal was executed with delicate precision. I can’t say enough good things about this place. I hope this place is around many more years, the Orlando restaurant culture needs places like this.